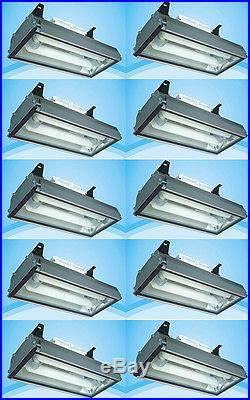 TEN New 400 Watt Induction Plant Growth Lights, with discount applied. These are fantastic GREAT grow lights at a bargain price. Since we are a volume supplier... And if you consider 10 lights... Rock bottom 40% discount pricing. NO ONE beats our price for our quality. For construction and the WHOLE sales information... Water resistant case to protect the light and shield during misting operations. Safety tempered glass cover for thorough light penetration. NOT just a cheap sheet metal reflector. Light absorption is the key to good growth. Our spectrum is designed for plants -- see the graphic above for test lab results of our bulbs. There is a good spike in the 470nm seedling range and a powerful plant growth 660nm range. Tempered glass, shock resistant cover. 120 volts to 277 volts variable current transformer. Length: 39 ¼ (997 mm). Height: 10 ¾ (270 mm). Width: 12 ½ (320 mm). Mounts on swing brackets that can be attached to a 2x4 or metal rail or even hung from chain. Centers for these brackets is 16. Easy up and down adjustment with plant growth. 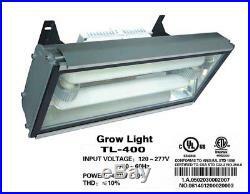 Our 400 watt induction grow light replaces a 1000 watt HID. Life: As much as 100,000 hour lamp life... 80,000 hours is most realistic. Uses 50-70% less energy than HPS or MH. With the variable voltage transformer, you can choose the voltage you connect from 120v to 277 volts. 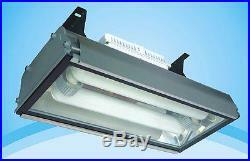 This induction grow light produces much less heat than HPS or MH. Since the Induction bulb burns under 190°F... You can get closer to the plants for a greater light intensity without burning the tender growing tips. We have seen as little as 6 off the foliage. We complete the necessary paperwork to export our products. The item "Set of 10 Plant Grow Light 400 Watt Induction Lighting Greenhouse Hang Lamp" is in sale since Wednesday, June 7, 2017. This item is in the category "Home & Garden\Yard, Garden & Outdoor Living\Gardening Supplies\Hydroponics & Seed Starting\Grow Light Kits". The seller is "vintagehw" and is located in Port Townsend, Washington.